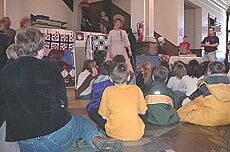 [FEB. 12, 2002] Children all over Logan County have spent the last few weeks concentrating their artistic efforts on our 16th president, Abraham Lincoln. In honor of Lincoln’s birthday the Logan County Arts and Craft Guild sponsored a poetry and picture contest for all school-age children of the county. Entries were judged based on subject, clarity, neatness and technical accuracy, and winners were announced at the guild-sponsored birthday party Saturday at the Logan County Courthouse. The celebration opened with a prayer by Henry Johnson, a local prison chaplain. This was followed by the annual placing of the wreath. Girl Scout Brownie Troop 479 carried a wreath across the courthouse and placed it in front of a statue of Abraham Lincoln. Representatives of the local Interveterans’ Council presented the American flag and a 21-gun salute. Civil War music, provided by The Prairie Aires, included "Tramp! Tramp! Tramp! The Boys are Marching" (a tune better known as "Jesus Loves the Little Children"), "Minstrel Boy" and a medley of "Camptown Races," "Little Liza Jane" and "Skip to my Lou." The educational time of the celebration was a presentation by Susan Kirby, author of the American Quilts books. She told stories about Abraham Lincoln and the people of the Midwest in the 1800s. Her lessons included what she called her "cue card quilts." These quilts contained pictures of buffalo, American Indians, snow and farmland. Using them, she was able to draw a vivid picture of life in the 19th century. Finally it was time for the highlights of the day: The entire assembly sang "Happy Birthday" to Lincoln, and the awards for the poetry and picture contest were handed out. Each winner in the elementary school levels received a copy of one of Kirby’s American Quilts books. The one high school winner received a book on the use of quilts in the Underground Railroad. Henry Johnson closed the program with a benediction. All of the children were invited to come and receive a "souvenir" of the day. The souvenir turned out to be a metal portrait of Abraham Lincoln — i.e., a penny. And what is a birthday without cake and ice cream? Both were served after the main festivities were over, to the delight of all participants and attendees. All entries in the poetry and picture contest can be seen during the month of February in the display window of the Red Cross downtown, next to Sew Many Friends. Lincoln Daily News and the Logan County Arts and Craft Guild look forward to another great party next year. [FEB. 11, 2002] Monday, when WMNW Classic Rock 96.3 in Atlanta becomes FIX 96, a new sports show with Jeff Mayfield and Greg Taylor will debut at 6 p.m.
Mayfield, a former Lincoln Community High School assistant coach and currently sports editor at Lincoln Daily News, said the hour-long show, "Sports Open Line," will encourage call-ins regarding all area sports. Men’s and women’s sports, teams from throughout the county, non-revenue sports as well as the bigger draws, college and professional sports of area interest — all are in the mix planned for the show. Basketball is the hot topic just now, and the opening segment will comment on the Lady Railers’ first regional playoff game. But expect a quick-moving format that includes many topics. Mayfield said he and Taylor will prepare a skeletal outline for each segment, but they hope that callers rather than they will determine the shape of the fan-friendly show. "Sports Open Line" will include interviews, live feeds and giveaways. The hosts plan to interview guests such as coaches and athletes and, after several segments have established an audience, to make them available to take calls. Broadcasts from satellite sites where fans congregate, such as college hangouts, are also in the plans. In addition, Mayfield and Taylor hope sometimes to give away items such as T-shirts and tickets. Sports to be covered include swimming, cross country, golf and tennis, as well as basketball, football and baseball. Area teams will include those from Mount Pulaski, Hartem, Illini Central and Warrensburg-Latham. Greg Taylor, already familiar to area listeners and readers as color commentator for Railer broadcasts and sports writer for Lincoln Daily News, is an avid Chicago Cubs fan, and Jeff Mayfield roots for the Cardinals. The two expect sometimes to play off each other in a pattern similar to that on ESPN’s "Pardon the Interruption." In addition, Mayfield said, Taylor is an eternal optimist, hoping to win every game. His enthusiasm will collide with Mayfield’s greater realism. Expect Mayfield to analyze and evaluate, using statistics and coaches’ explanations of strategies. When Taylor goes on about his Chicago favorites, Mayfield said, "I’ll remind him that the Cubs haven’t won since 1908." Friends for a long time, the two hosts met when Taylor was still in high school. According to Mayfield, he is an old man compared with the young whippersnapper, Taylor. They have talked of collaborating on a radio show for several years. Mayfield emphasized that the future of the show is in the hands of the advertisers and audience. If there is good response, "Sports Open Line" may expand beyond the one-hour weekly show. One of Mayfield’s dreams is to lead into Monday night football in the fall. Lincoln Daily News will be providing a live feed for listening to the broadcast via the Internet. This will enable fans traveling out of the area, college students and die-hard sports diaspora worldwide to catch the show. Just click on lincolndailynews.com, go to "Hear it Here!" located under the sports banner on the front page, and click. You’ll be there with Greg and Jeff listening to two new voices exclaiming our local sporting news. [FEB. 11, 2002] The Decatur Sister Cities Committee is hosting this year’s Illinois State Sister Cities Convention, on April 12 and 13 at the Holiday Inn in Decatur. Guest speaker will be John S. Kavulich II, president of the U.S.-Cuba Trade Economic Council, Inc., New York. For more information visit the website at www.decaturnet.org/dscc. [FEB. 8, 2002] Detective John Bunner is heading the investigations of two separate criminal activities that occurred in the same area of town three weeks apart. On the evening of Thursday, Jan. 17, a woman reported an incident that began in the Kroger parking lot. She was returning to her car after doing some shopping. As she approached the car, a person who was hiding in the back seat jumped out and put a gun to her, demanding her money. She gave her money to a person she believed was a heavyset man about 5-foot-8 and in his early 20s. Then, at gunpoint, the suspect made her get into the car and drive to another location. The suspect then got more money from the victim. No further harm came to the woman. On the night of Saturday, Feb. 2, a taxi driver called police from his cell phone to report someone had accosted him in his taxi. The driver went to pick up a fare in the 300 block of Feldman Drive. As he sat waiting for his customer, someone grabbed him and sprayed something in his eyes. He exited the cab and moved away a distance before stopping to call police on his cell phone. He could see the person looking for the cash drawer in the front seat of the cab. His description was much like that of the Kroger assailant except the suspect was female. Based on evidence, Lincoln Police went to the apartment of a 41-year-old woman living at 321 Feldman Drive. Due to her inconsistent statements, Kimberly L. Ingram was arrested for attempted robbery in the taxicab incident. The state’s attorney has the information on both cases. It has not been stated that the two incidents are linked. [FEB. 8, 2002] On the air less than a year, Classic Rock 96.3, WMNW in Atlanta is changing its name to FIX 96. The name change begins Feb. 11, when the station unveils its new local morning show and an evening open line for sports. General Manger Jim Ash hopes the new image will give the station a stronger identity across central Illinois. "We’re still going to be playing the classic rock music that’s so popular, but we feel that we’ve got a lot more to offer," Ash said. Besides music, the station broadcasts area high school football and basketball games, special events like the Logan County Fair and balloon fest, local news, and sports. Ash says the new "Morning FIX" will run from 7 to 10 a.m. weekdays. He plans to have surprise guests, trivia games, prizes and more. The new open-line sports show will run Mondays from 6 to 7 p.m. and will be hosted by local sports personalities Jeff Mayfield and Greg Taylor. Both men write sports news and features for Lincoln Daily News (www.lincolndailynews.com). Mayfield is a former Lincoln High School basketball assistant coach, and Taylor currently serves as the color commentator for Railer broadcasts. Ash says eventually the sports show will run five nights a week with a variety of hosts. "We think it’s going to be a big hit, not just in Lincoln, but all across central Illinois," Ash said. WMNW went on the air April 13, 2001. It serves DeWitt, Logan, Macon, Mason, McLean, Menard, Sangamon and Tazewell counties. 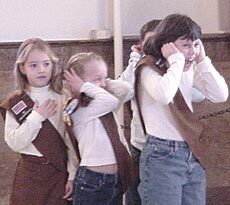 [FEB. 8, 2002] Drugs are one of the greatest threats currently facing America’s young people. Dedicated to minimizing this threat, Logan-Mason Mental Health has announced that it will join forces with the White House Office of National Drug Control Policy’s National Youth Anti-Drug Media Campaign in an effort to significantly reduce youth drug use in Logan and Mason counties. The National Youth Anti-Drug Media Campaign is a five-year initiative dedicated to reducing youth drug use in America. The campaign mainly targets middle-school-age adolescents (approximately 11- to 13-year-olds), along with their parents and primary caregivers. The integrated communications campaign uses a variety of communications vehicles to achieve its objectives, including advertising, the Internet, relationships with the entertainment industry, public education efforts and community partnerships, to teach children and parents about this issue. "Building on the momentum generated by the materials and messages provided by the campaign, we at Logan-Mason Mental Health will mobilize Logan and Mason counties around this issue to de-normalize drug use in our community, " said Kristi Simpson, prevention specialist at Logan-Mason Mental Health. "Our local efforts will enhance those occurring at the national level and will provide a ‘surround sound’ effect for Logan and Mason County’s children and parents that cannot be ignored." "Community involvement is essential to our success. In order to truly make an impact, the campaign’s anti-drug messages must be constantly repeated — by different people in a variety of ways," said Alan Levitt, director of the campaign. "When community organizations, such as Logan-Mason Mental Health, step up to the challenge and provide local leadership, change is accelerated and our children are the ultimate winners." For more information about prevention efforts and what you can do to help in Logan or Mason County, call Kristi Simpson, prevention specialist at Logan-Mason Mental Health, (217) 735-2272. [FEB. 7, 2002] "Soil moisture conditions over Illinois for spring have improved with the first significant winter storm that struck Illinois on January 30-31, generating a large swath of snow across the northern half of the state, freezing rain south of the snow band and rain over the rest of the state," says Jim Angel, state climatologist with the Illinois State Water Survey in Champaign. Precipitation was heaviest south of the band of maximum snow. Some west-central Illinois locations received more than 3 inches: Morton (3.41 inches), Washington (3.31 inches) and Peoria (3.17 inches). Based on preliminary storm data, Galesburg reported 17.3 inches of snow, and snowfall amounts of 10 to 12 inches were common in the Chicago area. There were reports of 12.3 inches (Chicago Botanic Garden), 12 inches (O’Hare) and 11.1 inches (Midway). "Even with this storm, winter snowfall remains at less than 50 percent of normal across central Illinois and less than 75 percent of normal across northern Illinois. Southern Illinois is at or above normal winter snowfall thanks to an earlier storm on January 18-19 that dropped between 3 and 6 inches at most locations. Normal February snowfall ranges from 8 inches in northeastern Illinois to 4-6 inches in central Illinois to 3 inches in southern Illinois. So we still have a chance for more snow this winter," says Angel. The 33.2 F average January temperature was 8.4 degrees above normal, the sixth warmest January on record since 1895 and tied with 1914 and 1921. The warmest January on record was 1933 with 37.6 F. South of a line from Galesburg to Kankakee, the average temperature was at or above 32 F. Based on preliminary data this month, only Galesburg reported a below-zero January temperature, -1 F on Jan. 2. Because December and November temperatures were also above average, the combined November-January period was the second warmest on record since 1895. "Through January 29, precipitation for the state was only 31 percent of normal. However, the late-month storm boosted the statewide total to 2.19 inches, 0.27 inches above normal. The storm also alleviated some concern about having adequate soil moisture for spring crops," concludes Angel. [FEB. 7, 2002] Police are currently investigating a reported bank robbery at Central Illinois Bank, 428 Keokuk St. The suspect has left the premises. The activity occurred just before 11:30 a.m. Thursday. Lincoln Police are doing a complete door-to-door canvas of the neighborhood. The suspect, said to be a white male, 40ish in age, escaped on foot and is believed to have left the area in a car. The robber is said to have made off with an undisclosed amount of money. It is believed that there is no relationship between this robbery and the Dec. 28 State Bank of Lincoln robbery. The FBI has been notified. [FEB. 6, 2002] Although some city officials may believe no racial profiling occurs in Lincoln, that statement is not accurate, according to Alderman Glenn Shelton, minister of the Second Baptist Church and the first African-American to serve on the city council. "There is a problem in this community," Shelton said at the Feb. 4 evening meeting of the council. The problem, he said, is that some African-Americans feel they are not being treated equally or with respect by police and other agencies, firemen, EMTs and hospital personnel. Shelton was referring to a comment made last week by Alderman Verl Prather, chair of the police committee, that statistics show there is no racial profiling in Lincoln and that no formal complaints of racial profiling have been made. The comment was quoted in The Courier. "I have a problem with someone drawing conclusions that there is no profiling," he told the council, then cited two incidents in which he himself was involved. In one incident, which occurred before he was on the council, he was pulled over by Logan County Sheriff’s Police in the Kroger parking lot one night, asked for identification and asked where he was going. He said he told the officers he was just coming from a prayer meeting and was then told this was a "courtesy stop" because his license plate light was out. By that time several more police cars had pulled up. He said he got out of his car to check the light and saw it was on. He said he even kicked the back of the car to see if the light was malfunctioning, but it remained on. Later, he said, he received an apology for the stop. He also reported that at one Sunday service, cars in the Second Baptist Church’s parking lot were checked. "I wonder if any white church members had their cars checked that day," he said. He refuted the statement that no formal complaints about racial profiling have been made, saying he has reported complaints to city officials. "If I go to the police chief or the mayor, that’s a complaint." He also noted that African-Americans make up only 2 percent of Lincoln’s population, but 5 percent of all those arrested and ticketed here are black people. However, he was quick to defend Mayor Beth Davis and Police Chief Rich Montcalm. "The police chief and this mayor take the issue seriously and will not tolerate it. I don’t want anyone to think these officials are not doing anything about it." He said he simply did not believe that statistics presented recently by Chief Montcalm could be interpreted to mean that there is no harassment or profiling of African-Americans in Lincoln. "Thank you for listening to my concerns," he concluded. "We will not tolerate this kind of behavior," Mayor Davis said. She urged any citizens with concerns about racial profiling to attend a meeting of the Mayor’s Commission on Disabilities, Seniors, Veterans and Youth, which she said also includes minorities. Chief Montcalm also said that racial profiling and harassment will not be tolerated and encouraged alderman and others to come to the Citizens Police Academy, a program starting in March in which citizens learn how the Police Department operates and ride along with officers on patrol.